Located in the Historic West King Street District, Bog Brewing Company brews and serves a variety of classic beer styles, Belgian-inspired ales and Florida inspired seasonals. Bog Brewing Company opened its doors in March 2016 and since has grown in lock step with the Northeast Florida craft beer scene. 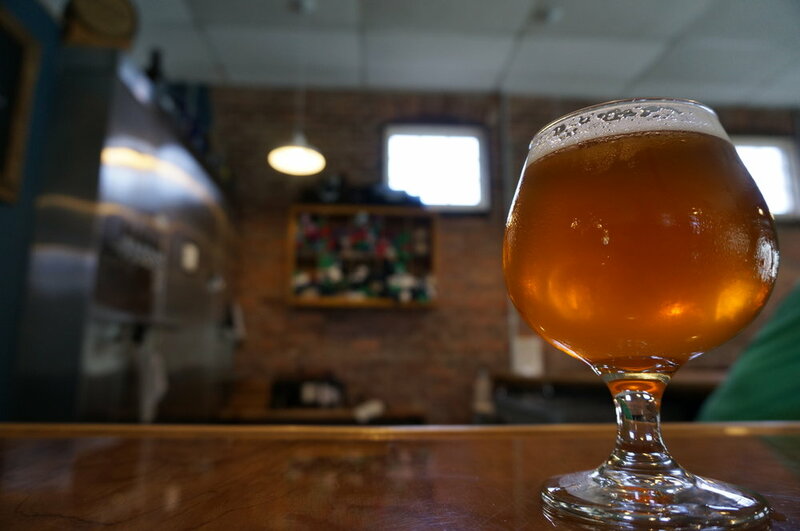 The draft list features seasonally influenced Belgian, English and American-style ales. Head Brewer and Co-Owner Steve Mendoza leverages his years of experience in the craft beer scene as well as his travels overseas to inform and inspire the beers he creates. Visitors can enjoy a unique selection of seasonal beers, like the Smoked Datil Ale, brewed with locally sourced hot peppers, or the Blueberry Wild Ale, which features a mixed fermentation that develops the unique floral and farm fresh flavors. We may not have all of your favorite beers on at all times, as we're constantly rotating half of the draft list, but we feel that's half the fun of the American craft beer scene--new beers and new experiences. 6.8% Our "House" Hazy IPA, this NE Style IPA is full bodied with generous clean Grapefruit and fresh picked Orange flavors and fruit character without being sweet. Dry-hopped for an eternity, this Hazy is wonderfully drinkable as it highlights the beautiful array of flavors found in hops when their more bitter side is left behind. 4.6% bursting with gooey tropical fruit aromas, deep orange in color and assertively sour. The fruit combines nicely with the acidic for an overwhelmingly balanced and very sessionable beer. 6.4% Another exploration of meandering flavors that endear us so strongly to this style. Pale in color and quite effervescent, with plentiful white pepper and a restrained eatery-fruit character. Just a touch of phenolics in the aroma. Close your eyes and you'd swear you were in Ghent. 4.3% Our Head Brewer is insanely proud of this Gose. An avid fisherman, he decided this Gose needed something a little extra to really set it off, so he took his skiff offshore and brought back 13 gallons of seawater, and over the next two and a half days evaporated the seawater off leaving only the beautiful sea salt. Still, not quite ready to settle, he fermented the Gose on Florida Orange and Tangerine Peel. Was all the effort worth it? Oh yes. Crisp with a soft acidity from our house culture of Lactobacillus and a pleasantly mild citrus finish, this is a perfect beer for the beach or the boat. 5.8% A traditional German black lager, our version accentuates the notes of milk chocolate found in the roasted barely while keeping the roastiness found in stouts and porters very restrained. 4.8% Light & crisp and ready for summer to set itself upon us. Supremely balanced, bright and thirst quenching. 5.1% We took a classic and pushed it as far as we could. Intensely spicy, this straw colored ale warms all the wall down. Mesquite & Applewood smoked Datil peppers (native to St. Augustine) lend a lightly smoked and robust heat to this otherwise light beer. 5.0% Smooth, rich, and boasting a deep copper & dirty ruby color, this traditional lager is simply satisfying. This is a malt forward beer meant be a hearty companion as we await spring time. 4.8% Our Session Hazy IPA is meant to really display the wonderful flavors of Azacca hops. Hazy with a pleasantly light body, this IPA drinks way above is ABV class. Perfect for beach days and fishing trips. 5.0% An old classic of The Bog that we don't get to brew as often as we once did. An extremely unique combination of grains come together to create the depth of flavors in this American Amber. Deep red to amber in color with a pleasant twinge of black malt help make every sip a new experience. 6.5% Fermented on over 80 pounds of grapefruit & Warrior Hops, this one-off IPA is a kind of shout out to the IPAs of years gone by. Amber in color with tons of grapefruit pith and resinous piney goodness, sometimes its nice to sit back and remember the old days.